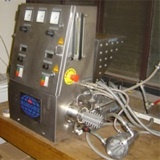 The HAAKE MARS and RheoStress 1 rheometers determine various rheological parameters by shearing a test fluid between two surfaces, e.g. between concentric cylinders or between two flat, circular plates. The rheometer measures the torque applied and the rotation rate of the moving cylinder or plate. Established methods exist to convert the observed torque and rotation rate into shear stress and shear strain. Measurements can be either rotational (rotating continuously in the same direction) or oscillatory. The MARS rheometer includes a combined rheometer-microscope module (RheoScope). This has an integral microscope with a digital video-camera attachment that allows particle motions to be filmed during deformation to be linked to details of the rheological measurement. We have a long-standing relationship with HAAKE. 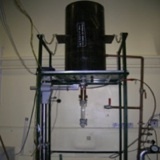 All rheometers in the GFD lab are HAAKE instruments, including the MARS and a RheoStress 1 shown above. Additional to these sophisticated instruments, HAAKE have donated to us a VT501 viscometer. This is a very nice, robust, easy-to-use instrument that we have used mainly for undergraduate teaching. It has also been used in the field (in a porta-cabin in a quarry) to good effect. We are very grateful to HAAKE for this addition to our teaching resources. Long and narrow flume for studies of entrainment and sedimentation from pyroclastic density currents . The aerator produces bubble-liquid emulsions. Compressed air is injected into the stream of liquid just before it enters the mixing head. The mixing head comprises a rotor, rotating at an adjustable rate, and a stator which bear interlocking teeth. A cold room can keep temperatures of up to -30°C. It allows storage of sediment samples or ice cores, and experiments that require a low temperature environment. The shock tube apparatus (including high speed camera) allows the investigation of fragmentation processes of two-phase volcanological flows.